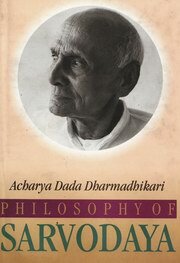 In this book, Dada gives us a clear analysis of the fundamentals of Sarvodya philosophy. A revolutionary versatile writer and powerful orator, Dada is regarded as on e fof the best interpreters of the philosophy of Sarvodya. This book is based on the talks by Dada before a selected audience. In speeches such as these some repetition becomes inevitable. However it must be remembered that it occurs in different contexts and cannot be erased, because its omission will not make the subject matter easily intelligible. As is natural with talks, they cannot be said to be exhaustive. Being extempore, several things remain unsaid. This is why perhaps it would be ideal for the readers to get acquainted with Dada’s other books. Dada’s efforts were aimed at inspiring you to think on your own. Shankar Trimbak Dharmadhikari, better known as Acharya Dada Dharmadhikari, was born on June 18th, 1899 at Multapi in Betul disctrict in Madhya Pradesh. He studied at the Indore Christian College, Indore and the Morris College, Nagpur. He left college in the second year to join the Non-Cooperation Movement launched by Mahatma Gandhi. He did not go back to any educational institution after that but spent a year studying the vedantic treatises of Shri Sankaracharya. From 1931 to 1935 he taught at the Tilak Vidyalaya, Nagpur. From 1935 to 1946 he lived in Bajajwadi, Wardha and was connected with the Gandhi Seva Sangh. From 1938 to 1943 he edited Sarvodaya, the Hindi organ of the Gandhi Seva Sangh. Member of the historic Provincial Legislative Assembly and the Constituent Assembly from 1946 to 1951, he was president of the Kaladi Sarvodaya Sammelan, Kerala in 1957. He also edited the Hindi weekly, Bhoodan Yagna. He was actively connected with the organization of youth and students and worked for social reforms. He founded the Rashtriya Yuvak Sangh in the Central Provinces. Dada Dharmadhikari was awarded the Gandhi Award of the Rashtrabhasha Prachar Samiti for his contribution to Hindi literature. He took part in every movement launched by Gandhiji and was imprisoned in 1930, 1932 and 1942. Acharya Dada Dharmadhikari passed away on 1st December 1985 at Sewagram in Wardha District.